First, The weather conditions here in Kelowna has been great !!!!! Sunny and hot in the most part. 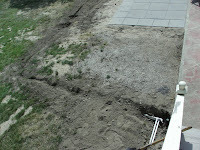 So as I said last time, I installed underground irrigation in my back yard. 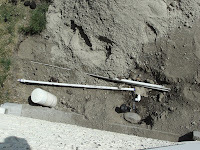 We did have it before but I ripped it up when I installed my sewer system last Fall. I had to wait to put the new sprinklers in because I knew I would be driving big trucks and trailers in the yard when I renewed our roof. 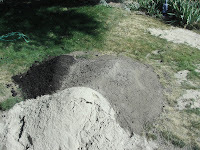 So now that the under ground irrigation is in again I can cover the lawn over with my special mixture of top soil, sand and Ogo grow. Ogo grow is a special natural fertilizer! Then sprinkle grass seed and water it. Hope fully soon after I will have a nice green lawn. Enjoy the pictures. The three piles of material are the special mix.